Enviro-serve Workboats has a large European fleet of offshore crew transfer, survey and guard vessels, providing specialist operations in the offshore oil and gas industry. With the variety of vessels in our fleet, we can offer our clients the most suitable vessels for their project. Founded in 2003, Enviro-serve’s vessels have a proven operational track record in this field, having worked on projects all around north-west Europe. Our in-house training by highly experienced captains results in a highly skilled crew, which has completed more than 300,000 safe transfers over the years, many in challenging sea conditions. Always thinking of the future, Enviro-serve continues to develop, build and operate crew transfer vessels to fit the requirements of the industry. As our company not only operates but also designs and builds offshore service vessels, we can adapt the vessel to the needs of the client and specific purposes on different projects. Our vessels have been purpose-built to transfer offshore personnel between shore, offshore wind turbines, construction vessels and other offshore assets. They are spacious, comfortable and fulfil the highest safety specifications. The vessels’ crews are highly experienced and trained by our in-house training programme, which benefits from the company’s experience throughout the years. Our newest designed vessel offers complete redundancy in the event of a mechanical failure, which means the vessel suffers minimal downtime as the project is completed. Our vessels either operate solely under the MCA SCV Workboat code or are also classified to Bureau Veritas N159 standard of offshore support vessels. This offers a high safety standard to accommodate 12 passengers safely at sea, up to 60nm-150nm offshore. The lounge area is fitted with comfortable independent suspension seats, cabins for a minimum of six to 14 personnel and on-board satellite TV and communication systems, as well as sanitary facilities and a galley for cooking, tea and coffee. The forward or aft deck space also allows larger parts and equipment to be carried besides the technicians’ tool bags. Our vessels are fitted with A frames, deck cranes and survey tables. We not only provide vessels; we provide a service: safe personnel transfer. We are committed to the highest possible standard of operational safety. Among other safety equipment, the vessels carry life rafts, a rescue net and a sling for emergency situations. The vessels are equipped with high-spec navigation and radio equipment. French shipbuilder Navalu has visited the port of Ostend, Belgium, to present its catamaran SeaFox. Enviro-serve is managed and run by a small team of experienced and skilled staff, optimising efficiency and enabling a personal service to customers. 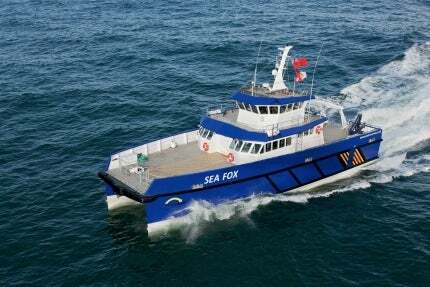 Navalu has launched the SeaFox, an offshore wind farm service catamaran, for the UK wind farm service provider Enviro-serve.